Aged in brand new American oak barrels toasted to the brewery’s specifications, Woodcut No. 7 rings in at 12.5 percent ABV and boasts notes of chocolate, vanilla, graham cracker and brown sugar in the nose. Odell Brewing Co. received its first shipment of oak barrels from Canton Cooperage in Kentucky in fall 2007. The barrels, cut from new American oak, were specifically crafted with a medium toast to give the beer added flavor and depth. The Woodcut Series of barrel-aged beers was born. Woodcut offerings are crafted with select hops and malted barley on the brewery’s pilot brewing system. After fermentation, the beer is chilled and then transferred to the oak barrels for aging. As the beer ages, the wood imparts unique and complex flavors. Woodcut ales are then bottled conditioned in 750-ml Belgian-style bottles with a cork-and-cage finish. Early this week, on Oct. 21, Odell Brewing introduced Woodcut No. 7, the seventh brew in the acclaimed series. Each Woodcut offering is aged in new oak barrels, and this year, the brewery channeled its dark side crafting a rich Russian Imperial Stout. Aged in brand new American oak barrels toasted to the brewery’s specifications, Woodcut No. 7 rings in at 12.5 percent ABV and boasts notes of chocolate, vanilla, graham cracker and brown sugar in the nose. The chocolate carries through in the flavor with hints of maple, vanilla and toffee from the wood. 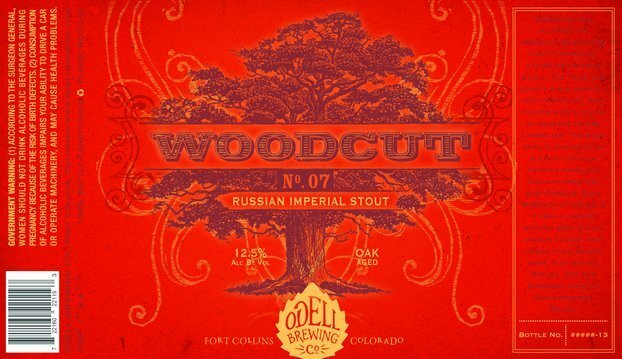 Odell Brewing will celebrate the debut of Woodcut No. 7 in the Tap Room this weekend (Oct. 26, and Oct. 27). Guests can try the brew paired with a variety of cheese and chocolate samples from Whole Foods Market Fort Collins, as well as live music from 3-5 p.m. on Sunday. Woodcut No. 7 is available in cork and cage finished Belgian-style bottles throughout the brewery’s ten state distribution region. Ed Malnar liked this on Facebook.